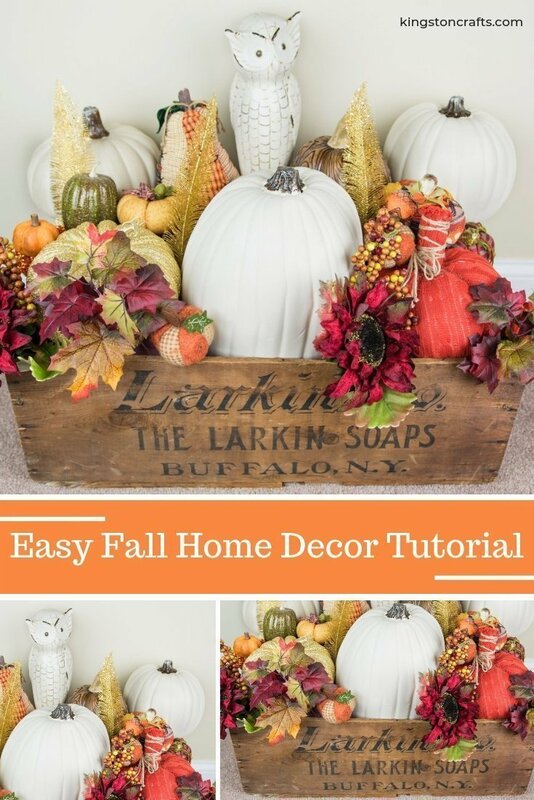 Learn how to use all those pumpkins that you have been buying to create your own piece of fall home decor, is less than 30 minutes! I’m a pumpkin hoarder. There. I said it. I buy every cute pumpkin I see – and we won’t even talk about the “after Thanksgiving” Fall decor sales. So what do I do with my pumpkin bonanza? Now that I’m home from my whirlwind world travels I’m ready to nestle in and get our home ready for my FAVORITE season…so I put together a quick video (complete with help from a nosey great dane) to show you how I used an antique box to create a piece of home decor that uses what you already have around the house and can be customized to any theme! Separate pumpkins in to piles by size. Stuff box/tub “overfull” with sheets or newspapers – the weight of the pumpkins will flatten the stuffing as you work. Arrange the pumpkins in the box/tub, starting with the largest pumpkins. Add the medium pumpkins, then the smallest pumpkins, then the floral picks to fill in any empty spaces. CHECK OUT THESE OTHER POSTS! PrevPreviousPinterest Hack – Use Pool Noodles to Organize and Store Your Boots! I’m a cheese loving, jeans wearing, great dane mommy-ing military wife currently living a dream on the shores of Maryland. I am a Craft Expert on the Home Shopping Network and the luckiest girl in the world because I get to play with paper and glue for a living. So happy to have you here! At Kingston Crafts you’ll find projects you can ACTUALLY make! I’m sharing step by step tutorials, printables and SVGs, home décor and holiday ideas for everyone – from beginners to experts alike. Thank you for stopping by Kingston Crafts! I love it when you post about my work! Pretty please, link back to my site when you do. All images, unless otherwise stated, are copyrighted under Kingston Crafts. Kingston Crafts is a participant in the Amazon Services LLC Associates Program, an affiliate advertising program designed to provide a means for sites to earn advertising fees by advertising and linking to Amazon.com.